A hillside walk affords a spectacular view of Karrat Fjord (photo: Tricia Welsh). Discover the beauty of the Northern Passage (photo: Tricia Welsh). 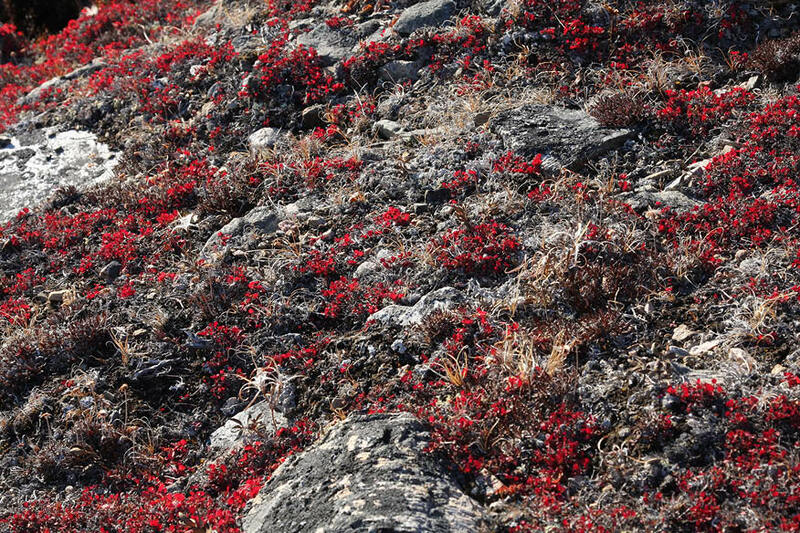 Wildflowers provide a splash of colour (photo: Tricia Welsh). 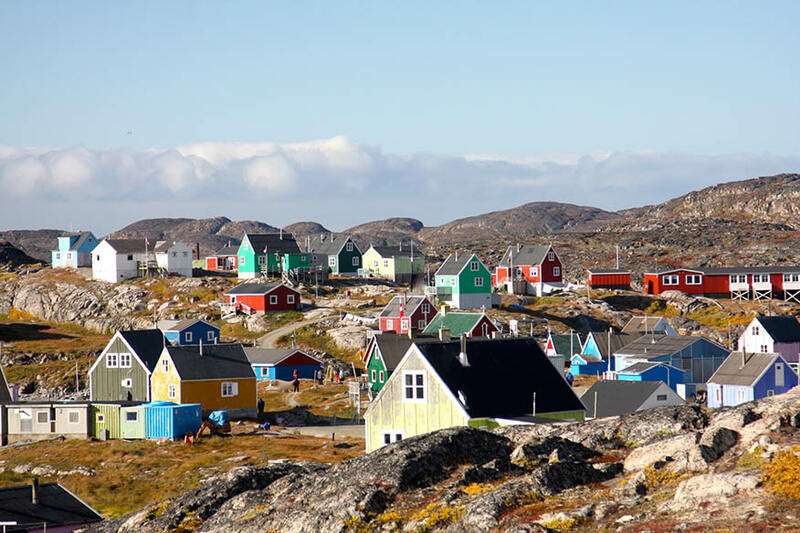 The colourful houses of Itilleq, a village in Greenland (photo: Tricia Welsh). Taking a Zodiac through the icebergs of Karrat Fjord (photo: Tricia Welsh). The Ocean Endeavour in Dundas (photo: Tricia Welsh). 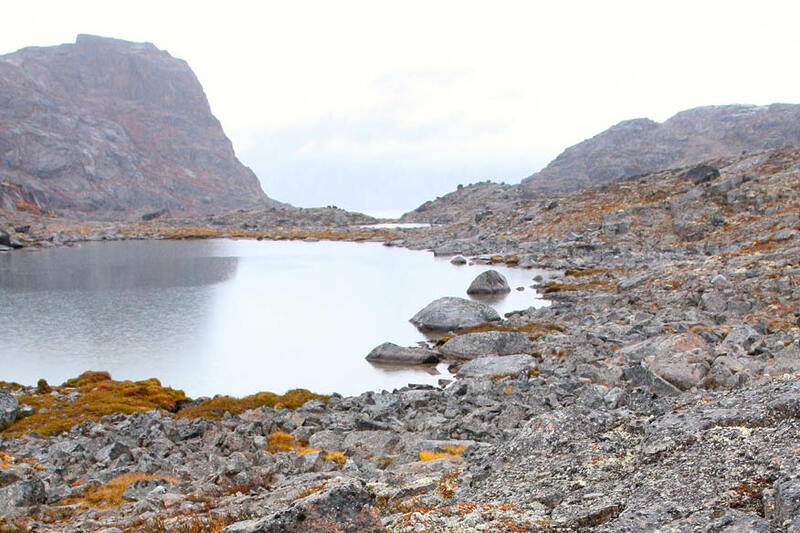 There's nowhere quite like Greenland (photo: Tricia Welsh). An old Hudson's Bay Company store in Fort Ross (photo: Tricia Welsh). Polar bear, caribou and muskox skins (photo: Tricia Welsh). 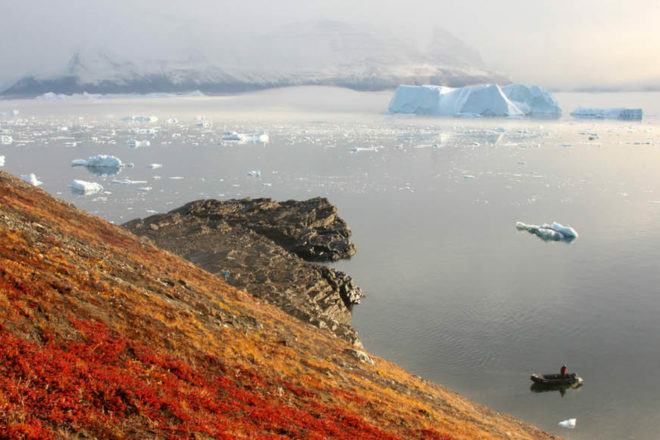 A cruising journey by sea through the Northwest Passage, from the wilds of Canada to the little–discovered wonders of Greenland, mesmerises with the unaffected beauty of its top-of-the-world location and down-to-earth locals (Tricia Welsh). It’s not every day you can breakfast with celebrated author Margaret Atwood, lunch with Arctic explorer James Raffan and then dine with astronaut Charlie Duke, one of just a dozen men who have walked on the moon. But it’s all in a day’s travel for me. Its big-name rollcall is one of the (many) things that recommended the Arctic expedition specialists Adventure Canada to me. Following a two-hour private charter flight from Edmonton, my cruise begins in Kugluktuk (formerly Coppermine) in south-west Nunavut. The Ocean Endeavour, a new vessel for the season, can cater to up to 198 passengers in 10 categories of comfortable cabins. Our company of 169 passengers comprises mostly Canadians, with about 20 Americans, a handful of Brits, Australians and New Zealanders, plus a crew of 125 and an expedition staff of 38. Our route closely follows the paths taken by early Arctic explorers such as Sir John Franklin, Dr John Rae, John and James Clark Ross, Roald Amundsen (who went on to lead the first expedition that reached the South Pole in 1911) and Robert Peary to name a few. They were looking either to reach the North Pole (which Peary claimed to do in 1909) or to find the elusive Northwest Passage that would potentially open a sea route linking the North Atlantic Ocean with the North Pacific Ocean, through the Canadian Arctic archipelago extending from Baffin Bay near Greenland to the Bering Strait between Alaska and Siberia. I can’t wait to feel the bracing Arctic air and soon learn that dressing in layers for such temperatures is something of an art form. During my first foray ashore I am almost too hot – but at least I’ll know how better to monitor the layers for future excursions. Winters here can dip down to a bracing –40°C (even to a shuddering –60°C on occasion), but today it’s a pleasant nine. 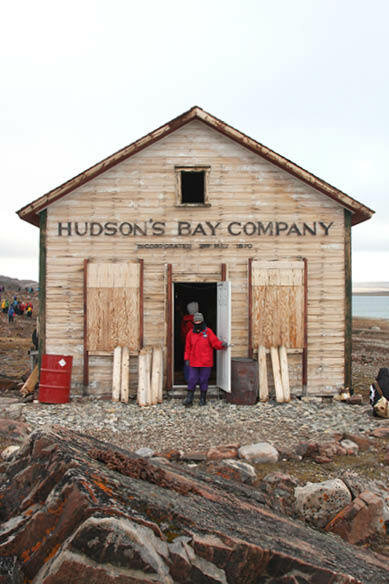 We visit remote former Hudson’s Bay Company trading posts and derelict Royal Canadian Mounted Police detachments, dodging showers of rain and occasional heavy fog. An early highlight is sailing through picturesque Bellot Strait where we have our first real sightings of polar bears and muskox grazing on a high plateau, all the while keeping an eye out for the elusive narwhal, a cousin of the dolphin, whose up-to-three-metre-long tusks were once thought to belong to the mythical unicorn. A small family operation, Adventure Canada endeavours to have a family member on each cruise. We score Matthew James (MJ) Bradley Swan, son of the co-founder, Matthew Swan, who’s been working for the company since he was just a lad. On this cruise, he’s being groomed to take over from retiring expedition leader Stefan Kindberg, an Arctic veteran who knows the waters and icy conditions like his own backyard. Together with Captain Peter Gluske, they plan our progress a few days in advance. Each night, we view satellite maps showing the progress of the sea ice as it tracks south from the polar sea. 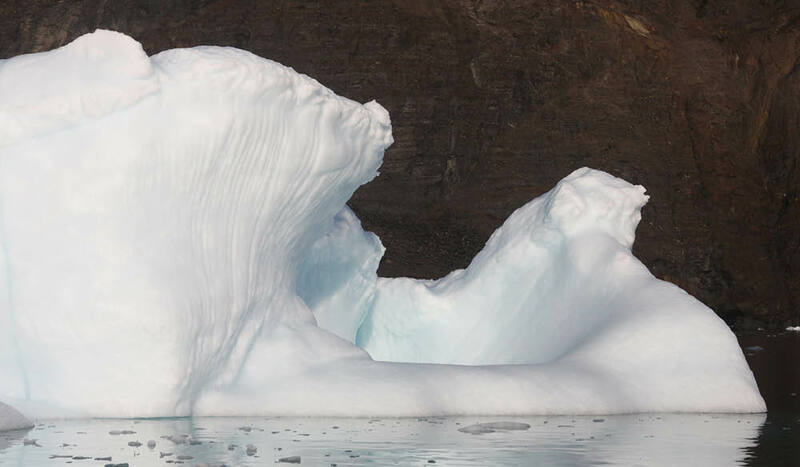 According to Kindberg, the ice is the most critical element on any Arctic cruise. It will be touch and go when we make our way into Grise Fiord (meaning ‘place that never thaws’ in Inuktitut); if the ice moves in while we are moored, we might be stuck there for the winter, or for a few days at least. But the ice abates and it’s full steam ahead towards this Inuit community of just 130, the most northerly civilian community in Canada. Once ashore, 17-year-old Olaf Christensen acts as guide and proudly shows us his town: the quaint Christian church, the co-op where items are not priced – “if you need it, you just pay up” – and to his storage sheds that he disappears into, emerging with arms draped with hides: a large caribou, an eight-foot-long polar bear skin and a massive woolly muskox hide, all of which, he proudly tells us, he hunted himself. 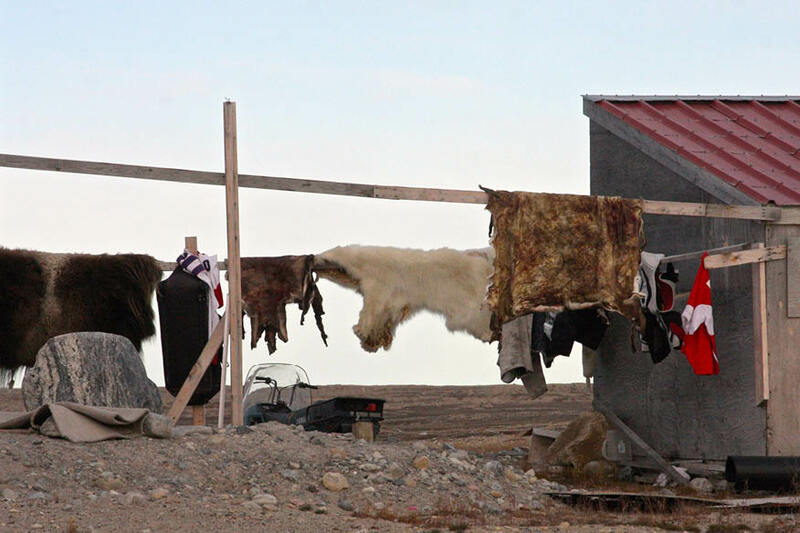 Later, the town gathers in the community hall to demonstrate Arctic sports, and women and young girls parade traditional dresses of beautifully embroidered and beaded clothes homemade from sealskin, Arctic fox and rabbit. The next day is at sea as we head south towards Cape York; we are keen to set foot on our first Greenland landing at Qaanaaq, population 600. Although it’s a mild seven-degree day and it’s already noon, ice-encrusted puddles crunch underfoot as we explore the colourful township with its excellent hilltop museum, appealing Danish-inspired blue church and well-stocked general store. A team of sled dogs howls on the windy shore’s edge as camera-toting passengers try to capture the iceberg-dotted scene for informative photography workshops, provided by noted professionals Freeman Patterson and André Gallant. We quickly learn that Greenland, the largest island in the world (Australia, which is larger in land mass, is a continent) isn’t green at all: 80 per cent of it is covered by an ice cap that can be three kilometres deep in places. While its physiography is part of the continent of North America (it is on the same tectonic plate), Greenland is part of the Kingdom of Denmark, but since 2009 has been self-governing, with its own parliament and government. Among the many highlights is our sunrise arrival into Karrat Fjord, surrounded by a sea of icebergs and lorded over by magnificent, 2000-metre-high snow-capped mountain peaks; the vistas here constantly shift and change as mist sweeps low over the water, almost enveloping the ship. The 60-metre-long fjord is mesmerising as we go ashore to hike up a nearby steep incline for even better views. Some passengers sit quietly to contemplate the scene and listen to icebergs calving, the sharp cracks echoing through the rocky mountains. 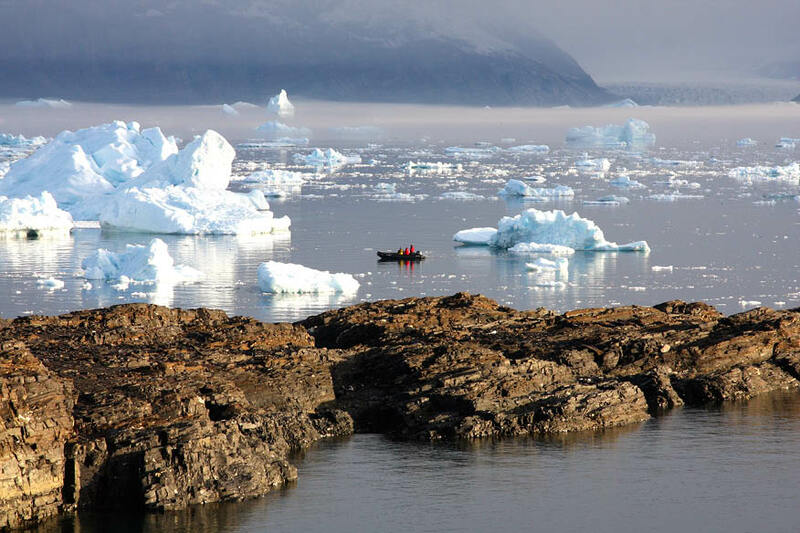 Next morning, our Zodiac inches its way through small icebergs and ice floes for our highly anticipated visit to Ilulissat, where fishing boats and small craft are ice-locked in the picturesque harbour. Home of explorer Knud Rasmussen, the town – with its pretty white-trimmed gabled houses – is best known for fast-flowing Ilulissat Icefjord, on its outskirts. Flowing up to 35 metres each day, it produces more icebergs than any other Arctic glacier – some as big as city buildings. A leisurely Zodiac cruise through the vast sea of icebergs is an eerie experience as the current drives them further north up the coastline. It’s the depth of expert knowledge onboard that makes such a cruise so compelling. Seabird biologist Mark Mallory is a Canada Research Chair at Acadia University and has written umpteen papers on Arctic birds; archaeologist Latonia Hartery has a PhD in circumpolar archaeology and knows the local structures probably better than anyone; while Arctic explorer James Raffan has written countless books and articles on the region. His latest, Circling the Midnight Sun: Culture and Change in the Invisible Arctic, is the topic of several of his riveting presentations. But it’s probably journalist-turned-Arctic author Ken McGoogan who stirs the pot the most. An ardent believer that it was Scottish explorer John Rae who first discovered the Northwest Passage, he has written several books on the subject including Lady Franklin’s Revenge and his most recent, Fatal Passage, which – because it went against the Franklin-as-hero tide – became a best-seller in Canada. He has traced Rae’s earlier footsteps in the Orkney Islands, where the explorer was born and where many early expeditions to find the passage set off from. Our last day encapsulates the entire adventure so far, with untold beauty, community spirit and an inevitable surprise all converging. We visit the tiny village of Itilleq with its rainbow-coloured houses – some with strips of meat drying on lines like washing, others with fresh reindeer antlers and remnants of a recent hunt. We contemplate moving epitaphs in a small graveyard before rallying in the town’s centre where local lads practise soccer for a game against a team cobbled from the Ocean Endeavour. It’s a fun, bonding experience, with the locals the undisputed winners. But the highlight occurs just after many passengers have gone to bed, when the Northern Lights put on one of the best shows that staff and crew say they have ever seen. Curtains of green with flashes of pink dance and cavort across the inky sky between snow-clad mountain peaks. 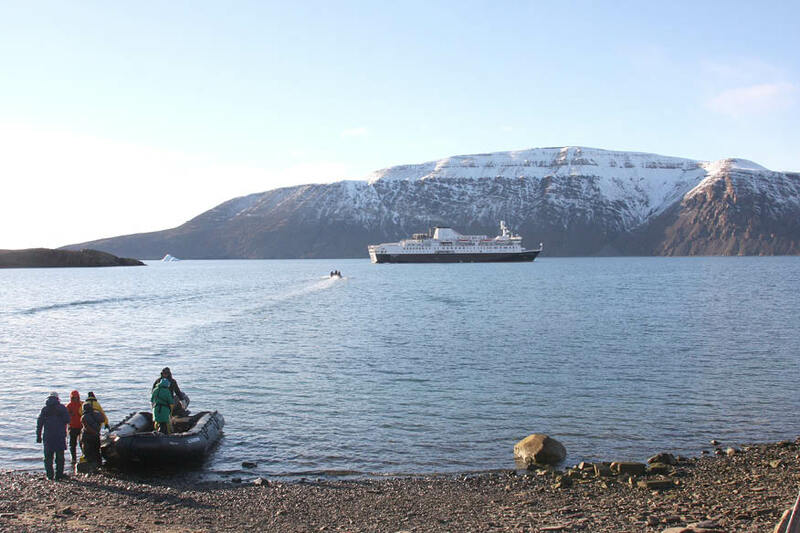 It is a fitting finale to one of the most extraordinary expedition cruises in the world. Getting there: Qantas flies daily from Brisbane, Sydney and Melbourne to Los Angeles with onward flights to Edmonton and return flights from Toronto. 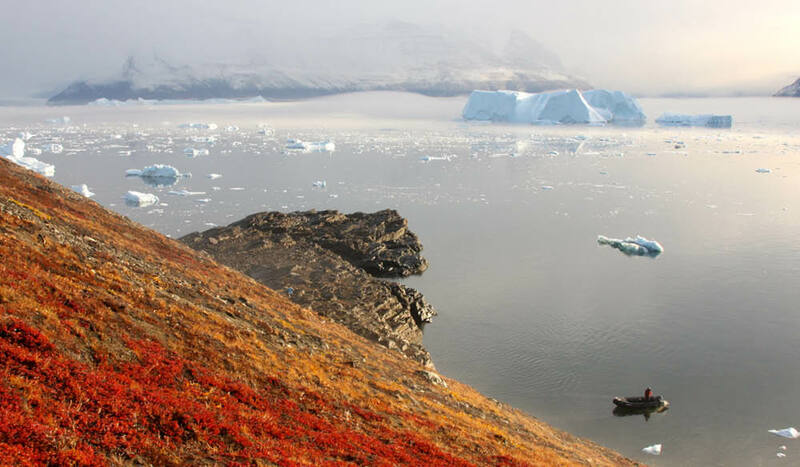 Cruising there: Adventure Canada’s 17-day ‘Out of the Northwest Passage’ expedition cruise begins in the northern Canada territory of Nunavut and ends in Greenland. Ports of call are weather-dependent and may be changed each day depending on movement of ice from the North Pole. The opposite route can be taken by joining the company’s ‘Into the Northwest Passage’ cruise. When to go: The cruise season in these parts is very short – from June to September. Visit Cruise Traveller for 2018 itineraries.